t There are two sets of oddly divided texts this week and next week. One way to deal with them is to combine the two texts about David and Bathsheba so that you read about both the sin and its consequence on one Sunday and combining John 6:1-21 and 24-35 to explore the feeding of the 5,000 and its meaning on the following Sunday. The David stories would fall on July 26th leaving the feeding story and the beginning of the four week exploration of its meaning for August 2, which is a communion Sunday in many congregations. Given that, I am posting all the suggestions for both double sets of readings on both Sundays – a little repetitive, but maybe easier to find what you want when you want it. t With today’s gospel we start a five week series of readings from John about the bread of life. One commentator said that the synoptics tell us the story of the Last Supper. John does not tell the story, but includes a whole chapter on its meaning. That invites us to do a lot of worship education about Communion during August. And, there is lots to point out and explain to the children with the adults listening in and learning, too. I’ll make a Communion connection for each text. These could become children’s times, be worked into the real sermon, or be practice sessions just before the Eucharist liturgy. t This story is heard very differently by people of different ages and sexes. 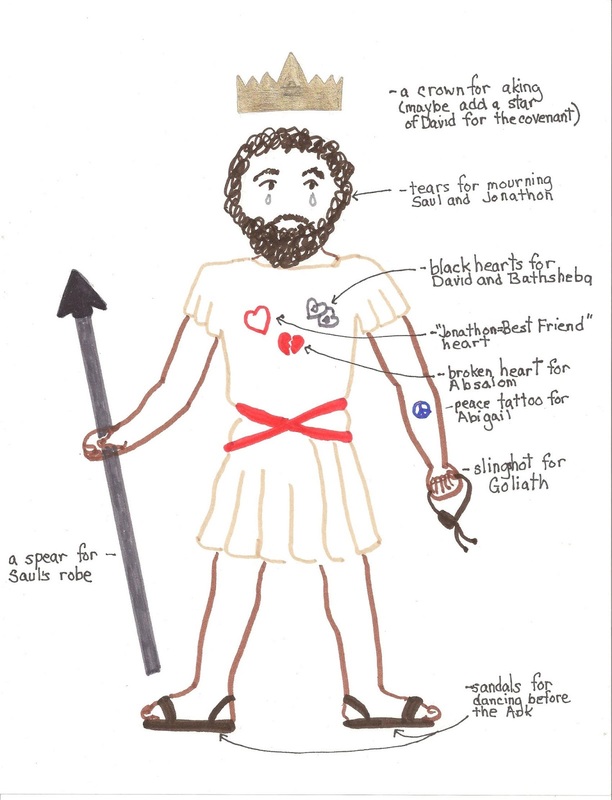 For children, David’s sin is not adultery, but stealing a man’s wife, then having him killed to cover up his theft. It’s a matter of breaking the rules. Young children assume that rules are made by the biggest, most powerful person in the room and are non-negotiable. To them this story says that even great King David should have followed the rules. No one is above Gods’ rules. As children grow through elementary school, they realize that many rules are indeed negotiable. Almost every group they are part of makes or clarifies its rules. They empathize with David’s wish to choose the rules he did or did not follow. In their own ways they follow his logic to get what they want. 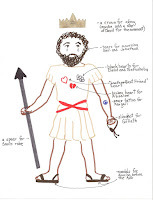 t If you have been adding props to a David figure each week, today add two connected black hearts with David or D or one and Bathsheba or B on the other. t The RCL matches Psalm 14 to the first half of the David – Bathsheba story and Psalm 51 to the last half. Children will catch little of Psalm 14’s insistence that we are all sinners. For them Psalm 51 is a much better choice. t Most children have little grasp of their own sinfulness. They know they do the occasional bad thing, but are not overwhelmed by it. Few have had the opportunity to steal a wife or murder. So, introduce Psalm 51 as the psalm David prayed after he had stolen Bathsheba and had her husband killed. The children can begin to understand now why the images in the prayer fit David and thus be ready to claim it for themselves when they need it later. t Children hear the poetic images in Psalm 51 literally. So, “create in me a clean heart” sounds like “cut me open, take out my heart, scrub it down, and then stick it back in me.” Ouch! Point this out and then explore what it really means. Describe how we feel dirty and yucky when know we have done things that are wrong and that have hurt other people. We feel so rotten that we want to hide. Then describe how clean and fresh and new we feel when we admit what we have done and do whatever we can to fix the hurt we have caused. An unhappy family road trip with fussing over toys, food and space in the back seat might be a good illustration of these dirty and clean feelings. t If you plan to use parts of Psalm 51 in the prayer of confession, gather the children before praying it. Briefly tell the children the story behind it and put its meaning into your own words. Then, pray it together. The prayers of confession generally come early in worship. It would be possible to pray them this week without comment at that time. Then, pray them again after a sermon in which their meaning has been explored in detail. During the sermon you might walk through that part of the liturgy explaining the sequence of confession, assurance, response, and passing the peace. You might even practice any sung responses. Repeating the whole process after this explanation will give it more meaning today and help worshipers of all ages participate in it more fully in the future. t After exploring David’s story and prayer, use verse 11 in a responsive prayer of confession for the whole congregation. Leader: Lord of all the world, there are so many things we want. We want to eat the best food, we want to wear stylish clothes, we want to do what we want when we want to do it. We want to be popular and successful and rich and beautiful. We want. We Want. We want. All: Create in me a clean heart, O God, and put a new and right spirit within me. Leader: God of justice, too often we will do anything to get what we want. We will break any rule. We will lie. We will cheat. We will steal. We will even hurt other people so we can have what we want. Leader: God, too often it seems that each of our sins leads to more sins. To hide the shameful things we have done, we break more rules and hurt more people. We lose our ways in half-truths and broken promises. Sometimes, the whole world feels dirty and lost and hopeless. Leader: Have mercy on us, O God. In your steady love and your abundant mercy, forgive our sins. Elisha’s feeding 100 people with very little food echoes the gospel story, but adds nothing new and different. Rather than add it, I’d focus on just the one gospel story for the children. t In connection with the feeding story, this psalm of praise becomes a meal time blessing. Describe mealtime blessings, not as a way to change the food, but as a way to remind the eaters that all food comes from God. Use this as an opportunity to challenge households to adopt this practice at least once a day. Assign this as worship homework for the coming week. 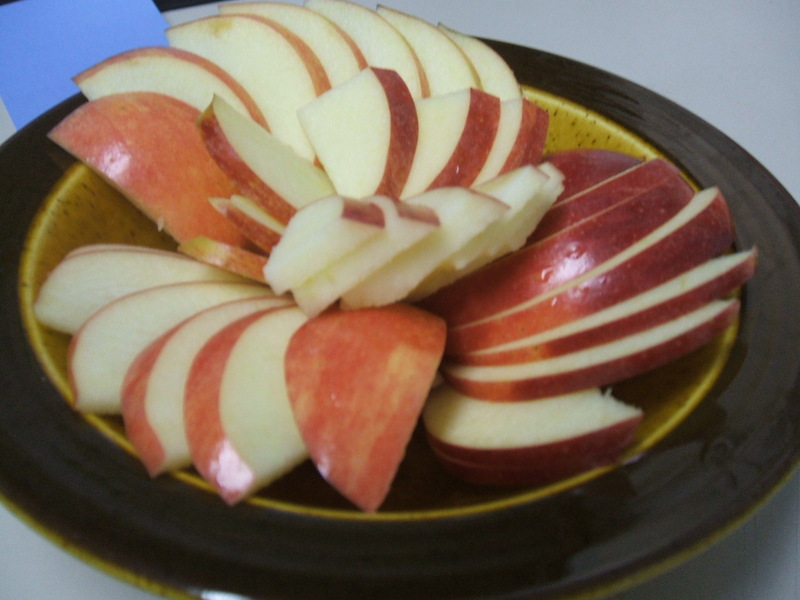 Suggest several possible blessings, including Psalm 145:10, 15-16.
t Get into the spirit of this psalm by inviting children forward to enjoy an apple slice or small cookie with you. When they arrive, identify with them all the people who were involved in getting this treat to you. Trace it all the way back to God who planned for the raw materials. In a brief prayer thank God for all these people and their work and praise God for the raw materials. Then give out and enjoy the treat. - they will get at least a hint of the incredible, too-large-to-imagine love of God at work in the world. t Children are more interested in the possibility of praying for the church than they are in Paul’s prayer for his churches. Invite them to create a prayer for your particular church. t Brainstorm prayer ideas together, writing them down as you go. Then, meld them together into one prayer you offer on behalf of the children. t Give children paper and colored pens with which to draw prayers for your church. Before passing out the supplies, brainstorm together people or groups in your congregation for which they might pray and general things they might say to God about this congregation. 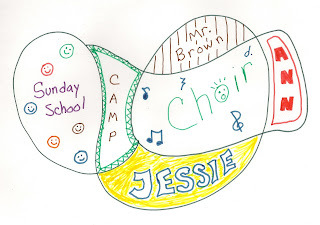 Show the children how to make a scribble prayer by drawing a large loose scribble, filling in the holes with names (or pictures) of people or groups, then decorating each hole as you talk to God about that person or group in the church. Invite the children to work on their prayers during the sermon and place them in the offering plates when they are passed. t It’s a good day to sing There’s A Wideness in God’s Mercy in connection with this text and/or the David – Bathsheba story. The words are simple enough that even middle elementary readers can catch many of them without help. t See the note at the beginning of this post about saving this text to combine with next week’s John reading, an especially good idea if Communion is not celebrated this week but next. To keep the focus on one story, I’d edit the reading to John 6:1-15 and 24-35 with the briefest of words about Jesus and the disciples getting to the other side of the sea between the read verses. t Include an older elementary aged boy among the readers today. If you read only verses 1-15, have them read by the boy. If you read verses 1-21 have the boy read verses 1-15 and a man read verses 16-21. If you combine today’s reading with next week’s text, have a boy read verses 1-15 and a man read verse 24-35. It might be a good father-son leadership responsibility. JESUS MAFA. Jesus multiplies the loaves and fish, from Art in the Christian Tradition, a project of the Vanderbilt Divinity Library, Nashville, TN. http://diglib.library.vanderbilt.edu/act-imagelink.pl?RC=48287 [retrieved June 17, 2015]. 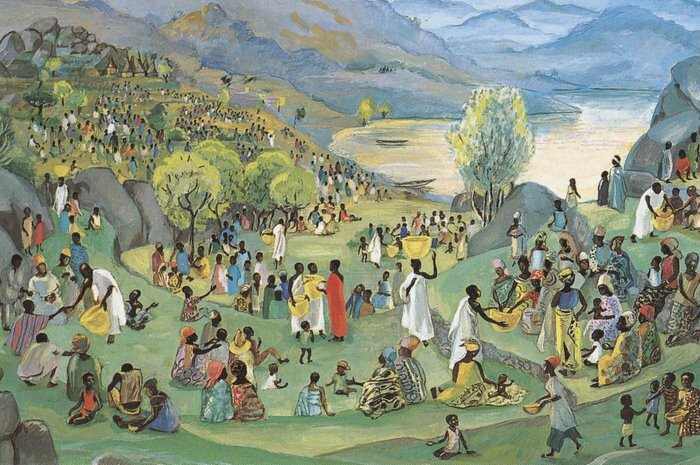 t The Jesus MAFA painting of this scene is very busy. Help children see what is there by asking them first to find Jesus who is wearing a red robe, then the disciples who are wearing white robes. Note that everyone else is “the crowd”. Then, ask what all the white robed disciples are doing. This could get you started into a sermon exploring the characters or could be sandwiched between two readings of the story so that worshipers hear the second reading with sharper attention. t There are a variety of answers to the question, “Why did Jesus feed the crowd this way? What was he trying to tell us?” To spin them out for children try some of the following. Jesus was telling us that he/God is very interested in getting people enough to eat. That makes it a good day to feature feeding ministries your church supports. Just as it was surprising that one’s boys lunch in Jesus’ hands could feed a crowd, so it is surprising how many people can eat when all of us pool our food and money. Give out grocery sacks printed with lists of things the local food bank needs and challenge families to fill them and deposit them at the food bank or at a designated spot at the church during the coming week. Will I get my fair share of the fries, the goldfish, the candies….? When is MY turn? And, will my turn be as long as theirs? Do they (especially parents, but also other loved adults and peers) love me as much as they love them? Ponder what Jesus is saying to us when we feel like we have to fight to get our fair share? To help children understand the fact that Jesus was interested in feeding people more than just food, display pictures of people in several “feeding” professions, e.g. teachers who feed students knowledge, social service caseworkers who work to get people food AND clothes, housing, whatever they need to survive, even a doctor who give people medicine so that they will be healthy. Discuss how each feeds people. Offer prayers for people who feed others. 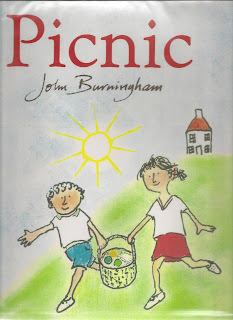 t With preschoolers read Picnic, by John Burningham. It tells the story of two children packing a picnic basket, meeting three friends whom they include in a day of adventures and returning home to bed. It is a simple story that captures the feel of the gospel picnic. People share what they have and have a great day together. 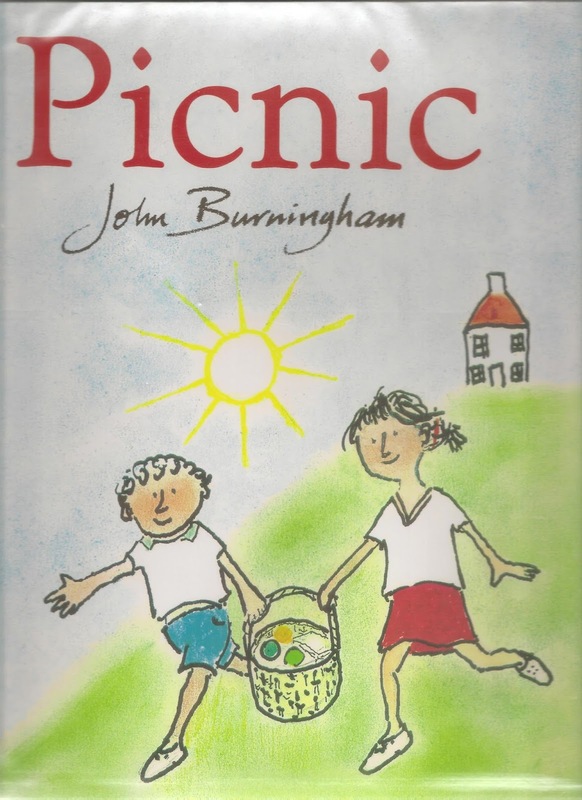 Read the book with young children, then encourage them to listen to the story of a day Jesus went on a picnic. 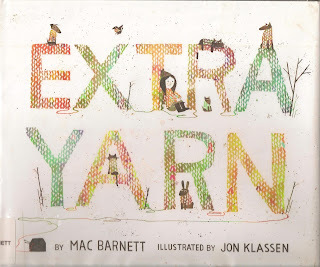 t After reading about the loaves and fishes, read children of all ages the first part of Extra Yarn, by Max Barnett. Showing the pictures is essential to bringing the story to full life. Stop after Annabelle has knit sweaters for the people and animals with “But it turned out she didn’t” (run out of yarn, that is). Ask “How is this story like the story in the Bible?” to start a conversation about the endless ways each of us can make life better for those around us – and for ourselves in the process. Urge the children to find the book in a library in order to learn about an evil archduke who tried to steal Annabelle’s box. But, do not complicate today's conversation by reading it in worship. t Do a little worship education about the phrase “Give us this day our daily bread” from the Lord’s Prayer. Point out that the pronouns are plural. We can’t pray just for our own needs. Identify things in addition to food that are physical needs for all people. Then, pray a responsive prayer of intercession for the hungry of the world. The congregation’s response to each petition is “Give us this day our daily bread.” This conversation could be addressed to the whole congregation just before the prayer or it could be a children’s time just before the congregation prays the Lord’s Prayer and other prayers of intercession. t If you read both the feeding story and Jesus walking on the water, introduce either or both as surprises. No one expected they would happen. Wear something surprising – maybe funny shoes under your robe or a wide clown tie? Stand before the children asking what about you is surprising today. Then ask them what question they asked when they first saw that. With any luck, it will be “why did you wear THAT?” Congratulate them on asking a good question. Tell them you wore THAT to help them recognize the right question to ask when you see something surprising. Go on to talk about Jesus’ feeding the crowd with one boy’s lunch. The right question to ask is not “how did he do that?” but “why did he do that?” or “what does that mean?” Briefly answer the “why?” question for Jesus’ surprising feeding of the crowd and encourage worshipers to ask the right question, i.e. the “why?” question, of other surprising things Jesus does. t If Communion will be celebrated this week, display the Eucharist loaf and perhaps a basket of many kinds of bread. Point out that bread comes in many shapes and sizes and is one food that people all around the world eat every day. With very young children, display a basket of many kinds of bread common to your community (hot day buns, tortillas/wraps, pizza crust, sliced sandwich bread, dinner rolls, etc.) Enjoy naming all the breads. Then point to the bread on the table. 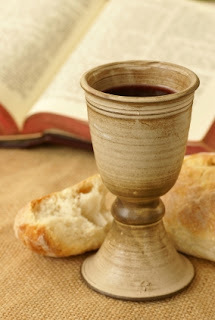 Remind the children that Jesus said to eat bread and drink from the cup at communion to remember him. Suggest that today they remember that Jesus fed people. Also urge them to remember Jesus every time they eat bread every day. With older children, display a basket of breads from around the world (pitas, Russian pumpernickel, French baguettes, Indian nan, cornbread, tortillas, etc.) Identify the different breads and the people who eat them. Note that all the people in the world eat bread every day. Point to the bread on the communion table and briefly ponder the possibility that Jesus chose bread as his symbol very carefully. He wanted his symbol to be something we all recognize and share every day. When we come to the Table we can imagine people all around the world eating bread with us. 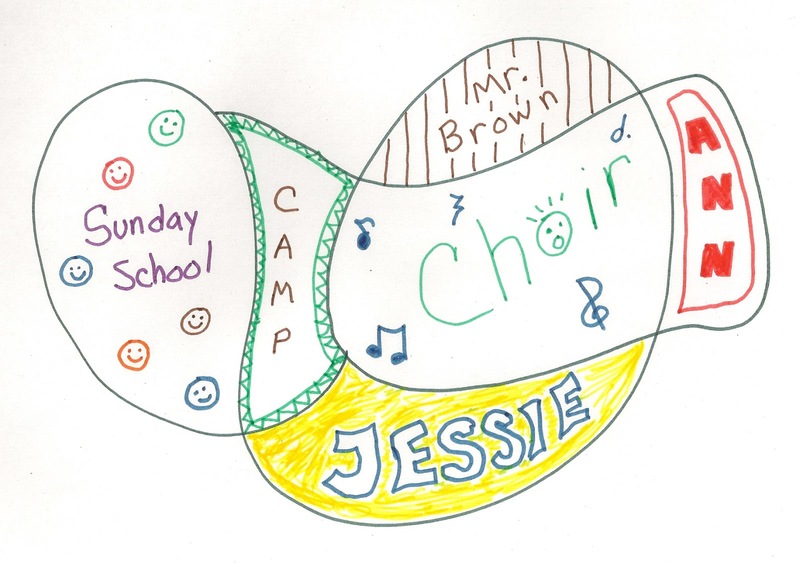 t Allison Bauer, a minster and blogger in Pennsylvania, claims that there is more to inviting children to the Table than just handing them the bread and cup. So one Sunday she gathered the children around the Table to talk about who is invited to the Table. She then had them issue the invitation with her by echoing each phrase of the Invitation as she said it to the children and the congregation. At open Tables, this is a great way to emphasize Jesus’ determination to be sure everyone gets to all the tables of life. Cool idea! 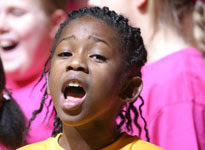 t Before singing Let Us Talents and Tongues Employ walk through the message of the repeated refrain. Recall how frightened Jesus’ friends were after he was killed on the cross – so frightened they could hardly breathe. Insist that the all the angels in heaven and all the earth was equally frightened. Then there was Easter morning. Jesus was alive again and they could all breathe. Read the last phrase noting that “the Word” can be the Bible and it can be Jesus because Jesus was God Word in human flesh. Restate the line “Because Jesus is alive there is enough bread and love for everybody!” Challenge even non-readers to sing the refrain. With this introduction to the refrain, older children will quickly begin to catch the meaning of the verses.